A method of cooking in which food is prepared (cooked) by placing it in a bath of hot water. The food is initially placed into a pan which is then placed within another pan containing hot water. A Hot Water Bath is a good method for melting chocolate, cooking custards, and similar dishes that may scorch or burn if placed in a pan over direct heat. 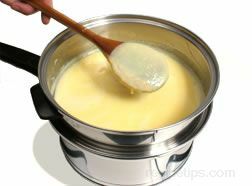 Another term used to describe this method of cooking is "bain-marie".